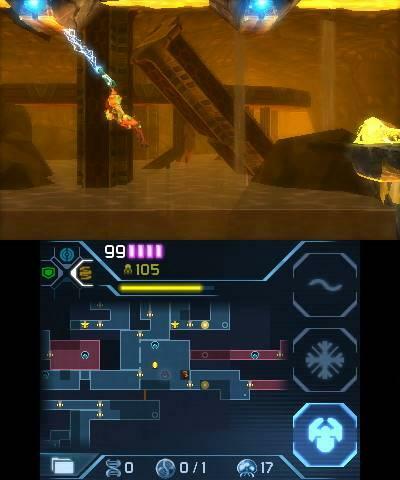 It’s been rough for Metroid fans over the past few years. After the tone-deaf disaster of Metroid Other M in 2010 and the flop of Metroid Prime Federation Force last year—a confusing spinoff nobody really wanted—it looked like Nintendo was going to dump Samus out behind the barn, next to the moldering corpse of F-Zero’s Captain Falcon. For the series’ 30th anniversary last year, the closest thing we got to a real Metroid game was a fan remake of Metroid II: Return of Samus. Smarmily titled Another Metroid 2 Remake (or AM2R for short), this decade-long labor of love was a breathtaking experience, reimagining the 1991 Game Boy title much as Nintendo’s Metroid: Zero Mission had revamped the 1987 NES original back in 2004. 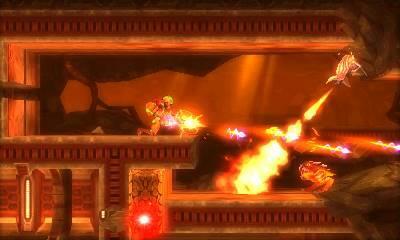 Naturally Nintendo shut AM2R down rather quickly, and at this year’s E3 we found out why. 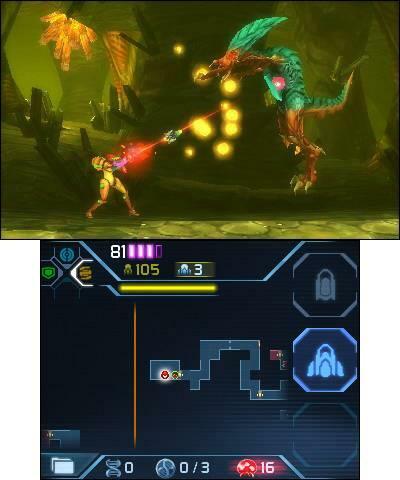 Not only was Nintendo working on Metroid Prime 4 for the Switch, they were also developing their own official Metroid II remake for the 3DS. Developed by Spanish studio MercurySteam and directed by Metroid co-creator Yoshio Sakamoto, Metroid: Samus Returns aims to give Metroid II the Zero Mission treatment, remaking and reimagining the game top to bottom. As developers of the Castlevania: Lords of Shadow series, MercurySteam already had ample experience with the aptly-named “Metroidvania” formula, but how did they do trying their hand at the originator of the action-exploration genre? Pretty damn fantastic, as it turns out. A quick disclaimer first: I won’t be comparing Samus Returns to AM2R in this review. As much as I love and respect AM2R, it wouldn’t be professional to put it up against the “official” remake in a review context. I might revisit the topic later for an in-depth comparison, but that’s an editorial for another day. For now, I want to judge Samus Returns on its own merits and how it stacks up against the original Metroid II. Now that that’s out of the way, let’s dig into Metroid: Samus Returns. Metroid II is probably my least favorite game in the series, and I must admit it’s the only Metroid game I haven’t beaten on original hardware. While it added several new items and gameplay innovations to the series and was an impressive accomplishment on the Game Boy, it’s arguably aged the worst of the original Metroid trilogy and it pales in comparison to the masterful Super Metroid on the SNES. Once the original NES Metroid was remade as Metroid: Zero Mission, Metroid II cried out for a modern refresh, but sadly none was forthcoming. 13 long years on from Zero Mission, it might feel a bit late to finally remake Metroid II, but at long last the one sore spot in the Metroid canon has been brought up to playable, enjoyable standards. The story is as simple as ever. 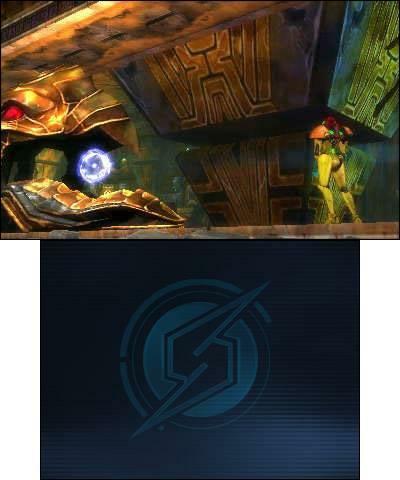 Samus Returns begins with a brief pictorial recap of Zero Mission. The Space Pirates intercepted a Galactic Federation research vessel outbound from SR388, the Metroid homeworld. 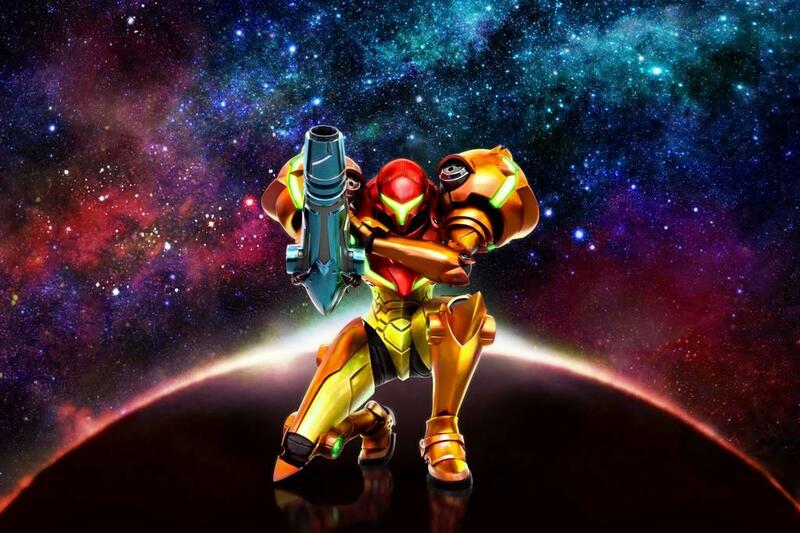 After the Pirates wreaked havoc trying to turn the Metroids into a bioweapon, the Galactic Federation council unanimously votes to send Samus Aran, the bounty hunter who put down the first Pirate-Metroid incursion, to SR388. 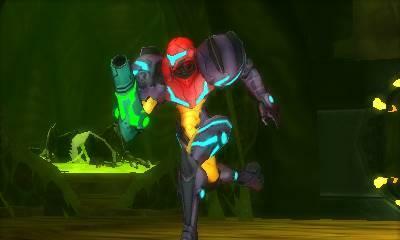 Her mission is straightforward: exterminate the Metroid species to prevent any future threat to galactic peace. This recap completely glosses over the Metroid Prime series, which annoyed me a bit; I get the feeling that Sakamoto-san regards Prime as a side-story at best, but I digress. It’s a succinct, effective setup for Samus Returns, and I admit to getting some chills as Samus piloted her gunship down to SR388 and emerged onto the surface of the hostile, alien world. This opening area is identical in layout to the first screen of Metroid II, with Samus starting at her ship and heading right into a cavern. Once you get below SR388’s surface, however, the map layout changes drastically. Samus Returns’ world bears a functional resemblance to Metroid II’s map—you’re generally progressing downward into ever more hostile territory—but you’d be hard-pressed to find specific similarities to the level geography. Progression remains the same. Samus is here to eradicate the Metroid species—all 40 of them—so each distinct area of the planet contains a set number of Metroids you need to hunt down. Each subsequent area is blocked by caverns flooded with deadly acid. A massive Chozo totem indicates how many Metroids lurk in each area, and will only drain the acid once you kill the requisite number and return their DNA samples to the totem. I liked this system; in Metroid II the general idea was the same—kill Metroids, earthquake happens, acid drains—but here there’s an actual explanation as to why it’s happening. 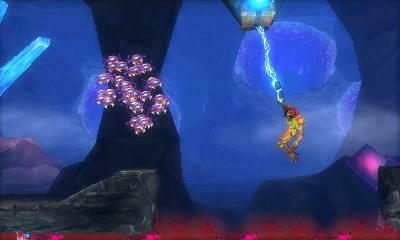 It’s good then that the main gameplay conceit—hunting the Metroids—has been greatly improved and expanded upon. In the original game there were still roughly 40 of the buggers stalking the caves of SR388, and they did progress through multiple stages of a life cycle so that they got harder and harder to fight the farther you progressed. That said, the battles always consisted of avoiding the creatures’ predictable attacks while hammering them with missiles until they disintegrated. 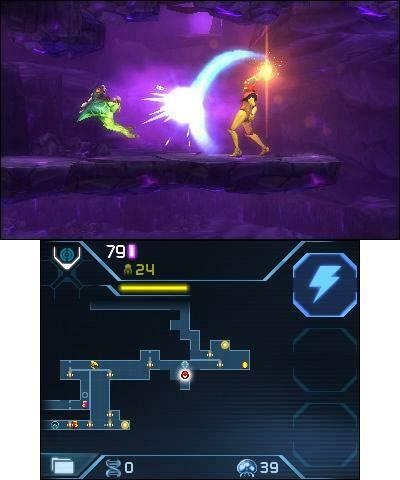 In Samus Returns, every Metroid fight is essentially a thrilling miniboss battle. For every life cycle stage I found myself memorizing attack patterns and weaknesses, using my ice beam to freeze a Metroid’s vulnerable underbelly and working out which combination of tactics and weapons would bring them down the fastest. The final few fights with the penultimate life stage—the Omega Metroid—are heart-pounding boss fights in their own right, testing my mettle as much as any end-world boss in previous Metroid games. 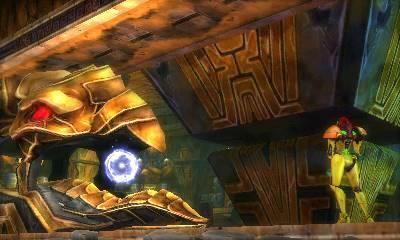 I actually looked forward to the hunt, relishing the subtle ping on my map that indicated a Metroid was close by. This is in sharp contrast to the original game, where battling the titular creatures turned into a chore early on. 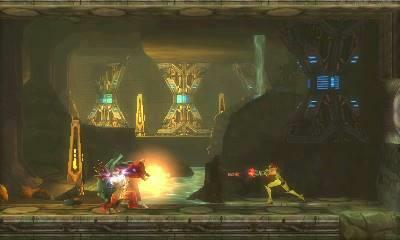 As in previous games, progression is also tied to Samus acquiring new gear and abilities, and growing her latent strength with generic ammo and energy expansions. As in the original Metroid II, Samus begins this adventure better equipped, with her signature morph ball transformation and a healthy stock of missiles. Metroid II also expanded upon the first game’s arsenal quite a bit, adding the wall-crawling spider ball, beam-splitting Spazer, and the devastating Plasma Beam. Samus Returns includes these abilities but like Zero Mission, it sprinkles in powerups from later games in the series. 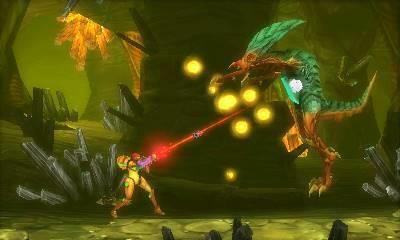 Samus Returns adds the Super Missiles, Power Bombs and Grapple Beam, the latter of which gets surprisingly creative use in many of the game’s hidden puzzles. If Samus Returns simply retrofitted the old game with existing powerups I would have been happy, but it also equips Samus with the brand new Aeion abilities. These are four new overdrive powers that draw from their own energy meter; Scan Pulse reveals segments of the map, Lightning Armor protects against hazards, Overcharge gives your beam devastating rapid-fire, and Slow Time is self-explanatory. I was worried these abilities were just training wheels for new players, but in fact they factor significantly into the gameplay and many of the puzzles. 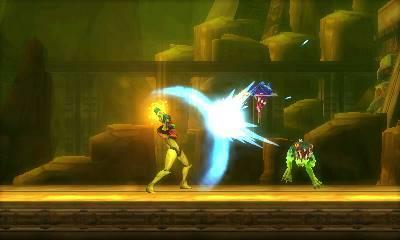 Samus also has two new basic abilities that can be used at any time. The X button allows her to perform a melee counter; most enemies in the game, including Metroids and bosses, have distinct melee attacks. Once you learn how they telegraph these moves, you can pull off a counterattack that stuns the enemy and makes them vulnerable to a one-shot instant kill. This takes a little time to get used to but after about an hour I found it second-nature and kind of addictive, as it rewards more health and Aeion energy than just blasting an enemy until they’re dead. I will mention that while it works great against single enemies, against two or more monsters it isn’t very effective. 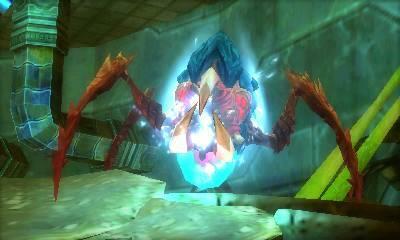 That said the melee counter makes Metroid and boss fights particularly thrilling. 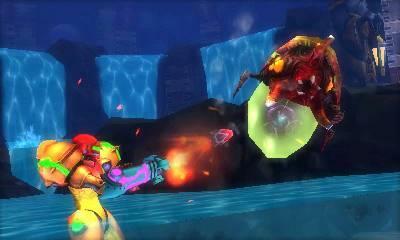 Samus can also free-aim in any direction. While previous games allowed her to aim and shoot in the eight cardinal directions of the D-pad, Samus Returns maps aiming to the circle pad. Holding the L-button plants Samus in place but lets you aim in 360 degrees. Her arm cannon even projects a laser sight that flashes red when you have a firing solution. It also flashes blue when you have an anchor point sighted with the Grapple Beam, which is quite handy. 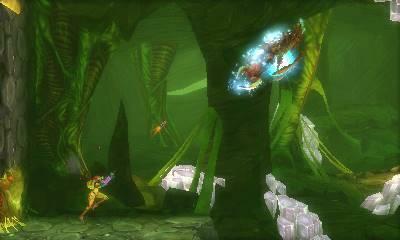 Free aim is such a simple, obvious addition but you’ll wonder how you ever got by without it in older Metroid games. Mastering these abilities and powerups flows quite naturally into the game’s progression, and very little feels superficial; obtaining a new ability or upgrade is actually a relief, because Samus Returns is surprisingly challenging on normal difficulty. 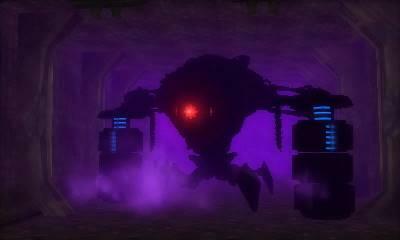 Even basic enemies inflict quite a bit of damage, and life-extending energy tanks don’t seem as numerous or frequent as they were in previous games. Some monsters and bosses can knock off a whole tank in a single hit, so enduring these fights feels like an even greater accomplishment, and the increased armor of the Varia and Gravity suit upgrades is more noticeable than ever. Samus Returns doesn’t pull its punches and I appreciated that; it’s a stout challenge to newcomers and series veterans alike, making SR388 feel like a truly unforgiving alien environment. It’s also fairly long, clocking in at around 12 hours for a first playthrough. 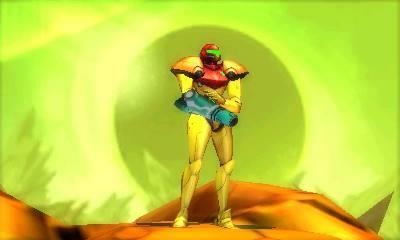 Considering I could casually breeze through Zero Mission in about four hours, Samus Returns offers a hefty adventure. MercurySteam nailed the classic Metroid gameplay formula but they didn’t skimp on the production values either. Samus Returns is a gorgeous game, one of the most technically accomplished on the 3DS. The art direction is a comfortable evolution of the comic-art style used in Zero Mission; everything from Samus to the Metroids looks just slightly bulkier and more menacing, while retaining a scifi pop-art flavor. When viewed in close-up shots, the somewhat low-poly meshes and low-res textures give the game an affectionate retro appearance, almost like a late-90s N64 release. In this way Samus Returns feels just a little bit like the N64 Metroid game we never got. The visuals really pop—no pun intended—when you push up that 3D slider. I’m not exaggerating when I say that Samus Returns is one of the most vivid, effective uses of the console’s glasses-free stereoscopic 3D; the game has some truly knock-out backgrounds and effects. Caverns stretch off into the distance, underground rivers wind behind and in front of the screen, and at least one boss fight is a heck of a lot easier when played in 3D because of the way its attacks use depth. The 3D effect is never gimmicky or required, but it does emphasize just how pretty this game is, and how talented MercurySteam’s artists were to use 3D to such subtle, evocative effect. On the audio side of things, long-time series composers Minako Hamano and Kenji Yamamoto are in typical fine form, delivering another haunting score that fuses snyth and orchestral elements. Metroid II’s original soundtrack was not the best use of the Game Boy’s admittedly limited audio hardware. Outside of the swashbuckling overworld theme, the music could be charitably described as “grating.” Many of the pieces consisted of droning off-tune melodies or collections of blips and beeps. In Samus Returns, these once-aggravating arrangements have been softened into atmospheric background, with other melodies layered overtop. As a note of personal preference, I will say that Samus Returns’ soundtrack skews more toward the ambient with a few hard-hitting boss and overworld themes, while I prefer the more melodic, robust soundtracks of Zero Mission, Super Metroid and the Prime series. That said, Yamamoto and Hamano have done an admirable job transforming what was once a painful listening experience into an actual atmospheric score. I can always tell a game is either fantastic or terrible if I can’t stop talking about it. Samus Returns falls firmly into the “fantastic” category. MercurySteam have taken a well-worn formula and breathed new life into it, giving side-scrolling Metroid a new lease on life. They’ve also single-handedly remade the most awkward entry in the Metroid series into a thrilling, challenging, and enjoyable experience from start to finish. That’s one hell of an accomplishment, and I fervently hope that MercurySteam collaborates with Nintendo to make two or three more of these, either on 3DS or Switch. Samus, and Metroid, are back, hopefully to stay. MercurySteam have pulled Samus from the jaws of death and delivered one of the best games in the series. 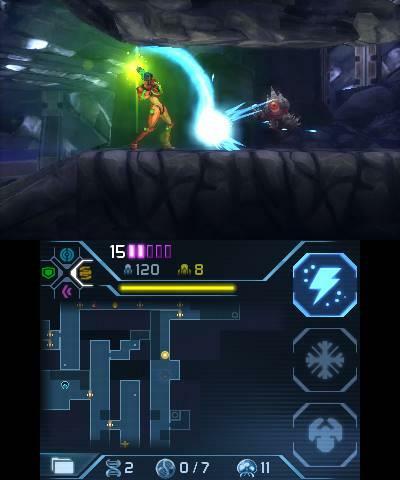 Samus Returns perfects and reimagines the gameplay of 2D Metroid games and delivers one of the best titles on the 3DS. Every self-respecting Nintendo fan should own Metroid: Samus Returns.